The pre-production sessions took place in Ole’s apartment in Oslo during five weekends in the course of fall/winter 2012. The three of us sat down and re-worked the demo versions one by one. Ole is responsible for most of the musical ideas for this album. During these weekends we basically re-worked and re-arranged the songs, and made new parts where we felt it was needed. Some songs ended up being quite different after these sessions, like Cypher, Number and Himmelfall. Other songs ended up quite similar to the early versions – only with some adjustments here and there (Requiem, Darkest White, Night on Earth). I remember travelling home from Oslo after these weekends with increasingly better gut feeling for each time. During this process the pieces of the puzzle fell into place, and it became clear what kind of album this would become. Parallel to this process there were several vocal sessions taking place in Oslo, Kristiansand and Stavanger. As we are living in different cities we were working simultaneously on different stuff and sending ideas back and forth to each other. We quite early decided to record the drums in Tanken studio with engineer Fredrik Wallumrød. The studio is located outside Oslo, and we also recorded drums for Rubicon there. We were very happy both with the process itself and the final result back then, and quite early decided to work with Fredrik again. Fredrik is a genuine, great guy and very good at what he’s doing. 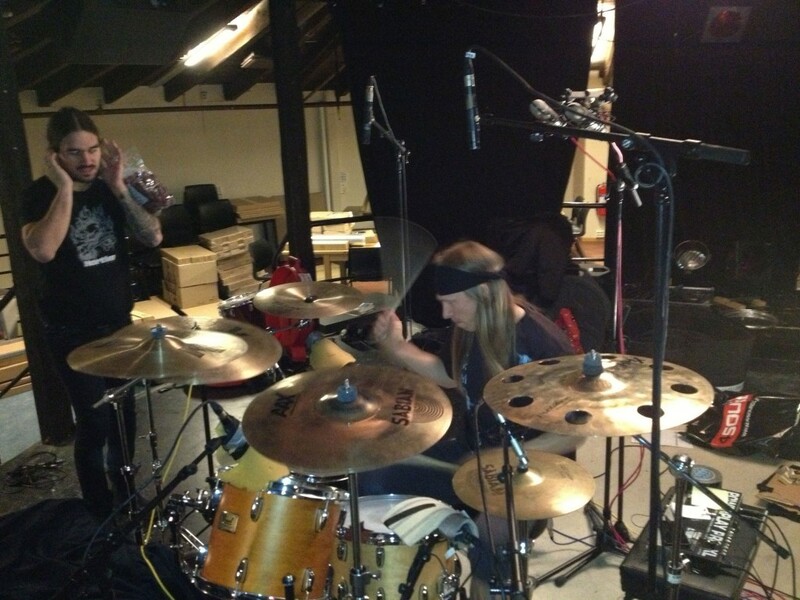 Fredrik is a drummer himself (El Caco), and so is his assistant engineer Sven Andréen. Other musicians and engineers/producers often tend to have a different approach to drum recordings, but recording with a drummer makes everything easier. Fredrik instantly heard what worked well and spotted the places where we should do something different. He is a creative guy who also contributed with good ideas. Tarald did a great job nailing the drum tracks. He had done a great job rehearsing the songs and basically knew every beat of every song by heart. Despite the same recording studio and engineer, the final result this time turned out quite different compared to Rubicon. The drum sound on Rubicon was more polished and controlled compared to the drum sound we aimed for with Darkest White. Tanken is a rather unique studio with a large recording room, known to be perfect for drum sound. Christer wanted to maintain the acoustic ambience from Tanken and you can actually hear on the album that the drums are recorded in a large room. Powerful natural sound with a lot of punch! The drum recordings in Tanken were a reminder how tired you get from listening carefully to drumtracks for 10-12 hours several days in a row. I remember feeling quite lobotomized on the late train back to Oslo together with Tarald and Ole after the studio sessions at Tanken. With the powerful sound of the drum recordings we had a solid base for the rest of the recordings. The next phase of the recordings was guitars and bass. Everything was recorded in Ole’s apartment. As the guitars were recorded digitally, we didn’t need a professional studio. It turned to be the perfect place for the purpose; recording day and night. The typical day was 18 hours of recording – 6 hours sleep. We’ve never before spent as much time on testing and experimenting with different guitar sounds as we did with Darkest White; trying out various tunings, guitars and sounds. The aim was always to find the ultimate combination for perfect guitar sound for each track. True to tradition, our new album is a very diverse one. Different songs and musical expressions need different sound, but it’s also been important for us to keep to the overview of the album as a whole. Consistency is important. 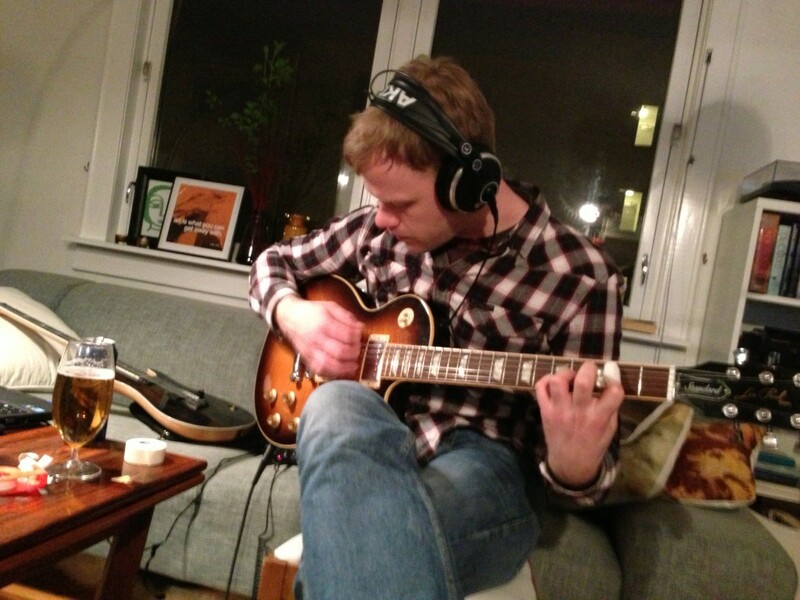 The guitar sessions started off with a long day of setting the sounds in Christer’s studio. Christer is a wizard when it comes to creating sounds, and he did an absolutely fantastic job with the guitar sounds. During the years we’ve recorded guitars with class amplifiers such as Engl, Marshall, Peavey and Mesa, but we’ve never managed to get as heavy and raw guitar-sound as we did this time. All guitars on the album are recorded digitally (with Axe FX from Fractal Audio). The eleven songs were recorded with nine different guitars (Mayones. Gibson, Ibanez, Fender, Gibson, Chandler) in five different tunings. We spent a lot of time test recording in order to identify the perfect combination for each song. I remember that the first song we recorded guitars for was Darkest White. After a lot of testing and soundchecking we recorded all the guitar tracks. It ended up sounding brutal and edgy, and we were very happy with the result. Just as we were on our way out to a restaurant for dinner we realized that we’d recorded the entire song in the wrong tuning (E instead of Eb). After finally nailing the first song it wasn’t something I was looking forward to, but we had to record all guitar tracks once more in the tuning that we felt worked best. 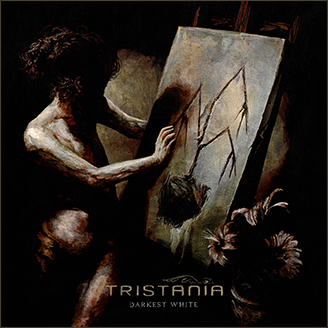 Darkest White is the first Tristania album with no acoustic guitars whatsoever. Not because it was a point in itself, but it simply wasn’t needed in these songs. I guess it reflects the brutal nature of this album. This entry was posted in News and tagged anders, darkest white, drums, Fredrik Wallumrød, guitars, ole, pre-recording, recording, Sven Andréen, Tanken studio, tarald. Bookmark the permalink. Thanks for the great studio reports! They are rellay enjoyable. The balance between information and own experiences is perfect. Now, I’m indeed looking forward to 31th of May. Thanks for writing to us! it’s really enjoyable to read and we can feel the emotions of the creation process, understanding better the album and work of you all!